History of MISIRLOU: 'Misirlou' started as a short film I wanted to do to showcase Venice, CA. It was intended to be a journey through the Character's eyes, using state of the art DSLR technology and Guerrilla filmmaking to create an interesting narrative POV. 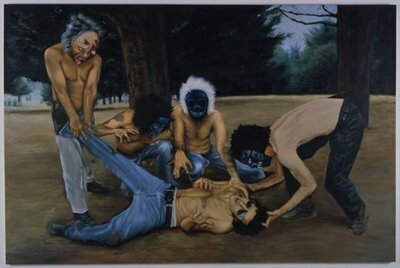 Being a fan of Wes Anderson, and artist Miguel Calderon, an interesting idea came to my head while viewing "Aggressively Mediocre/Mentally Challenged/Fantasy Island (circle one)"
Upon viewing the painting, all at once I discovered the conflict in 'Misirlou'. Also being a fan of Hunter S. Thompson, I incorporated Miguel's masked men and the adrenal gland drug made famous by Dr. Thompson into a unique plot. I started drafting the 'Misirlou' treatment in November 2010. I finished the script in September 2011. I am in need of financing to complete a promotional trailer for the film. Once the promo is finished, I will shop the project to try and generate the rest of the funding. Digital copy of the 'Misirlou' treatment. Links to all 'Misirlou' songs referenced in the screenplay.